The robo-advisor market has exploded and it has become nearly impossible to rank the platforms in terms of best to worst – after all, almost all robo-advisors are designed to provide extensive value to a specific set of clients. That being said, once you narrow your search parameters, it becomes much easier to find the robo-advisor designed for your unique needs. If a low fee robo-advisor is your top priority, then start your search here. 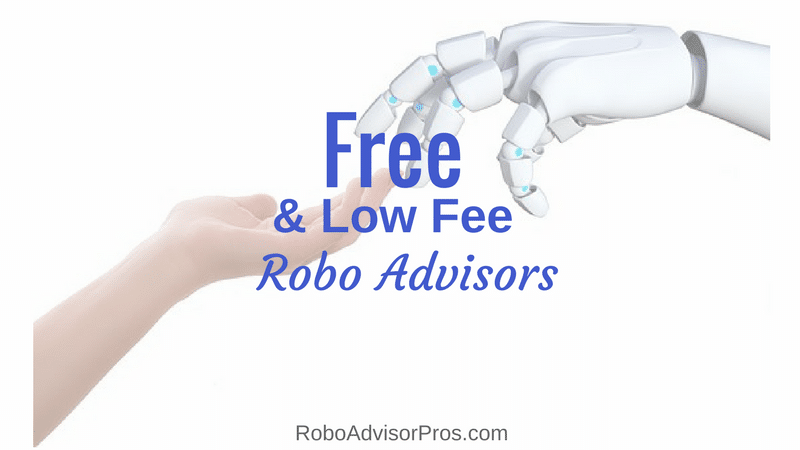 Here’s a handy list of low fee robo-advisors and free digital investment platforms. The following 6 robo-advisors combine excellent service, accessibility and variety with small—and even non-existent—fees. Betterment Digital charges 0.25% AUM for accounts up to $2,000,000, and management fees are waived entirely for accounts over that amount. Betterment Premium is for accounts over $100,000 and charges 0.40% AUM. Clients with Betterment Premium receive unlimited access to human financial planners and no management fees for accounts worth more than $2,000,000. One of the benefits of Betterment is that it allows clients to set up multiple goals with specific investment advice for each goal, including the Retirement Guide Calculator. Betterment also offers tax loss harvesting, investment rebalancing, and many fund choices including Vanguard and iShares ETFs and international bonds. Betterment supports both individual and join investment accounts, trusts, and Roth, traditional, SEP and rollover IRAs. There is also a Betterment for Business tool that can manage and administer workplace 401(k) plans. A new feature for all Betterment customers is the opportunity to text with a financial advisor. You don’t need to participate in Betterment Premium for this service. Clients also have access to socially responsible, smart beta and income portfolios. Assistance is available 24/7 through email, but clients can also reach phone and live chat support on weekdays from 9 am – 8 pm ET, or on weekends from 11 am – 6 pm ET. Direct access to the Betterment site. M1 Finance just might be the best of both DIY and robo-investment platforms. And, M1 Finance is free. Not only that, but you only need $100 to get started with M1 Finance. Investors create pie charts to visually design their portfolios. Investors can customize up to 100 slices of pie to include EFTs, stocks, or even other pies from a pool of stocks, ETFs and more. For investors not sure where to start, M1 Finance also offers pre-made expert pies to choose from such as hedge fund portolios, income portfolios and more. Similar to other robo-advisors, you can select a pre-made investment portfolio according to your risk tolerance from conservative to aggressive. Then M1 Finance rebalances those investment slices back to your desired investment percentages. The benefits of M1 Finance span the opportunity to invest across a wide swath of the investment market, automatic rebalancing and the lack of fees. In case you forgot, M1 Finance is free. Clients can sign up for one-on-one guide to the platform. Additionally, users can get help by email or phone 9-5 M-F CT and with the on-screen help button. SigFig manages and tracks all investments that are held in Fidelity, Schwab or TD Ameritrade accounts. 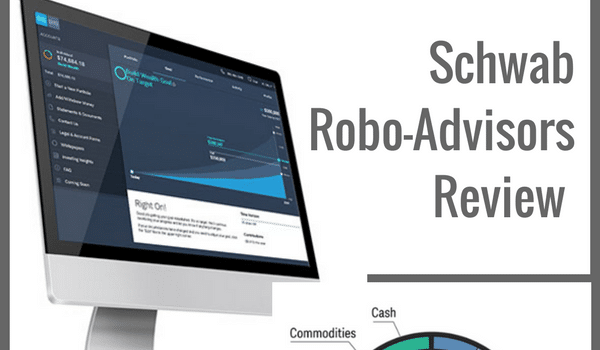 This robo-advisor uses a questionnaire to analyze your portfolio, make allocation and tax-efficient recommendations and helps to diversify investments across asset classes. SigFig also rebalances portfolios as needed. Asset Management Service is available with a minimum opening balance of $2,000. Accounts valued under $10,000 are managed for free. For accounts valued over $10,000, the fee is 0.25% AUM. There are no commission, trading or transaction fees associated with this service. For larger investment accounts, SigFig has a Diversified Income Service, for your bonds and fixed income investments. The minimum investment is $100,000, and comes with a 0.50% fee for portfolio management. As with the Asset Management Service, there are no commission, trading or transaction fees. SigFig offers investment funds in various ETFs, and include asset classes from both U.S. and international stocks and bonds. Recommendations include real estate ETFs and government, municipal and inflation bond funds. Currently, SigFig offers both individual and joint investment accounts, trusts, and Roth, traditional and rollover IRAs. They are also hoping to add 401(k), 529 plans and corporate accounts. Clients get unlimited investment advice, either via email (24/7), live chats or phone service (6 am – 6 pm PT on weekdays), or by scheduling appointments. 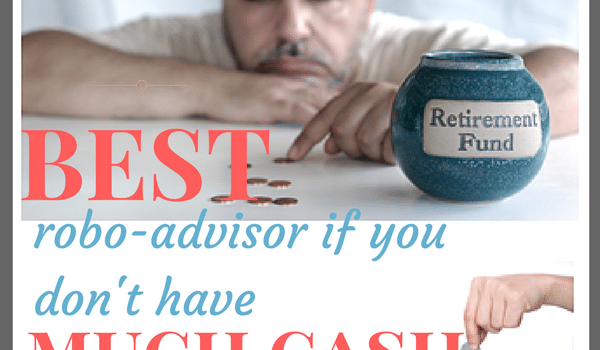 Bonus; M1 Finance vs Betterment – Which Robo-Advisor is Best for Me? Clients can start with Wealthfront’s digital investment portfolio management for only $500, making this robo-advisor easily accessible if you want to start investing without the massive upfront cost. Wealthfront’s fees are predictable and fair: the first $10,000 of any portfolio is managed for free, and accounts valued over $10,000 are managed for 0.25%. Like other robo-advisors, Wealthfront offers automated management, including investment reviews and rebalancing, to make sure you are still working toward achieving your goals. Their newly launched Path is Wealthfront’s fully mobile financial planning experience. Path gives you financial planning access, without having to talk to someone. Additional features include tax loss harvesting and plans for individuals who own and want to sell company stock. For portfolios over $100,000, Wealthfront uses direct investing services which are tax-optimized to help increase your return on investment and lower taxes. Wealthfront uses investment funds including Vanguard, Schwab, iShares and State Street ETFs. These ETFs include stocks, bonds, real estate, and natural resources/energy asset classes. In addition, clients can open both individual and join investment accounts, 529 college savings accounts, trusts, and IRAs (including Roth, traditional, SEP and rollover). Although clients get free automated investing advice, help is also available by phone from 10am – 8pm ET Monday through Friday, or via email at any time. WiseBanyan is an automated investment management robo-advisor that free investing and account management. That’s right: $0 in management fees! WiseBanyan offers fee-for-service add ons. The newly launched WiseBanyan Portfolio Plus only costs $3 per month and offers 30+ customizable portfolios including tech, socially conscious, small cap, utilities, pot and more. The optional Wise Harvesting service for a 0.25% AUM fee. This is only for taxable accounts, and is capped at $20/month. This robo-advisor is appealing to new clients and beginning investors with its $1 minimum opening balance. WiseBanyan offers automated financial advice, automatic deposits, portfolio rebalancing, and the ability to create and fund goals-specific milestones. Available investment funds include Vanguard, iShares, and SPDR ETFs. Clients can also open Roth, traditional, SEP and rollover IRAs. Only individual investment accounts are available. 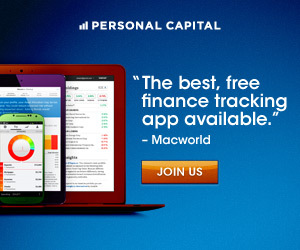 Love this robo-advisor? WiseBanyan even offers a $20 signup bonus for clients with funded accounts who refer their friends. If the automated advice provided does not meet clients’ needs, there is phone assistance available on weekdays from 10am – 8 pm ET, or 24/7 email availability. Schwab brings it home with $0 in advisory fees. They also do not charge commission or account service fees. The minimum balance for this robo-advisor is $5,000, which makes it out of reach for some beginning investors, but the benefits are certainly worth it in terms of service and funds available. As is typical for robo-advisors, Schwab Intelligent Portfolios have clients fill out a risk questionnaire. After assessing your risk tolerance, the algorithms generate a diversified investment portfolio, which is rebalanced regularly. Portfolio construction, rebalancing and management are all free. Schwab also offers tax loss harvesting for accounts valued over $50,000. For investment funds, Schwab Intelligent Portfolios uses low fee stock, bond, real estate and precious metals ETFs, which are predominantly from Schwab. The investment accounts can be set up for individuals or as joint accounts. Schwab also offers trusts and Roth, traditional and rollover IRAs. On top of all this, clients get free 24/7 access to help over the phone every day of the year. 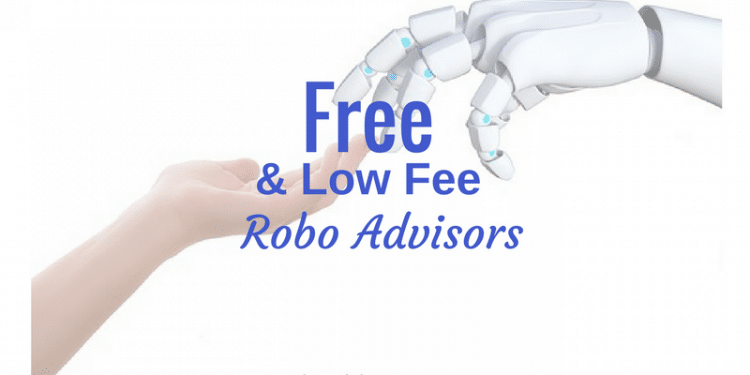 In short, low-fee robo-advisors are most certainly available. 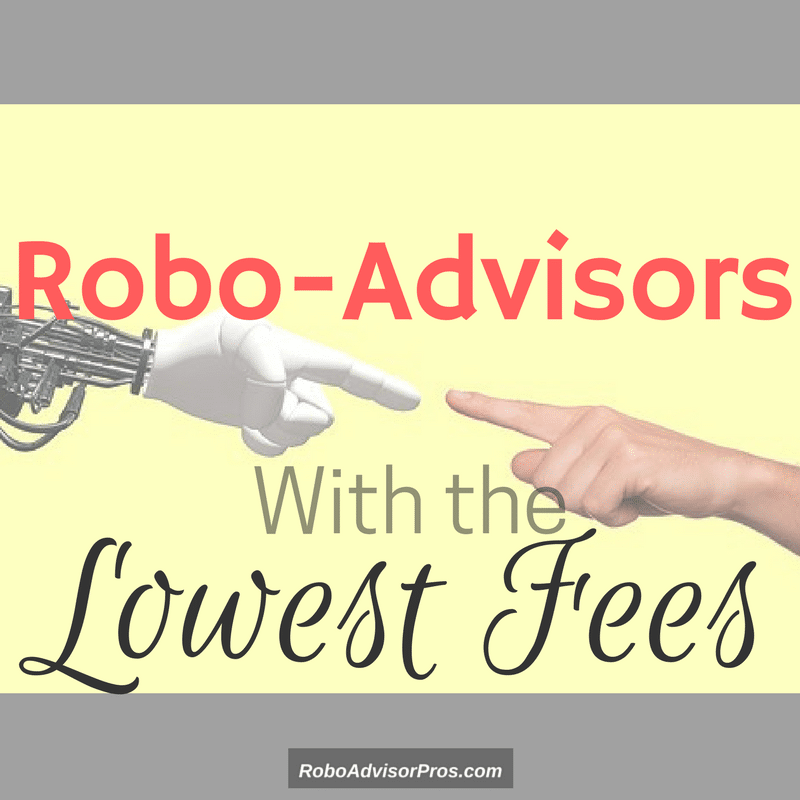 While this list is designed to help you find a robo-advisor that will balance service with low or no management fees, other factors should be considered as well. As with any financial investment, do your homework. Even though Betterment charges more than Schwab for portfolio management, Betterment’s referral program might make it more appealing for some. Other robo-advisors might have more variety in terms of investment funds, making the slight increase in management fees worth it to certain investors. Overall, consider what features best work with your financial goals. *Disclosure: Please note that this article may contain affiliate links which means that – at zero cost to you – I might earn a commission if you sign up or buy through the affiliate link. That said, I never recommend anything I don’t believe is valuable.